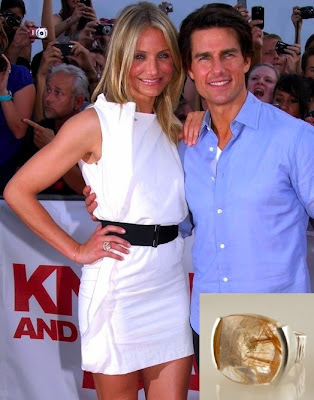 Recently the superstar Cameron Diaz and Tom Cruise were in Munich, Germany for the German premiere of their movie "Knight and Day." Cameron was dressed for summer in a cool white Bottega Veneta dress and Pierre Hardy shoes. On her finger was a large sterling silver and rutilated quartz Tiki ring designed from Joan Horning. The ring is sells for $735 and like all other Hornig pieces, profits from this item are donated to charity. The material of this ring is Rutiliated quartz,which is an intriguing stone. The needle-like golden inclusions in the stone are created by rutile, a major ore of titanium. Rutile is a mineral that is made up mostly of titanium dioxide, or TiO2. As a mineral, rutile is very high on the refractive index and disperses more than almost any other mineral. This means that when rutile appears in other minerals, it almost always appears in long, thin shots of color. Rutilus is, in fact, the Latin word for red. The mineral gained this name because some specimens are a lovely deep red color. Rutile, however, can also appear in brown and gray tones. Rutilated quartz is found around the world including Australia, Brazil, Kazakhstan, Madagascar, Norway, Pakistan and also United States. Many of the mountain ranges in America contain large deposits of quartz. Rutilated quartz is an energizing stone and said to have anti-aging properties. It certainly appears to be working for Diaz.